Deborah Sugg Ryan (Professor of Design History, University of Portsmouth) is author of Ideal homes 1918-39: Domestic design and suburban modernism. She is series consultant and on-screen expert on BBC2’s A House Through Time. In episode 3 she talked about a 1930s’ kitchen cabinet. In this extract from her book, she tells the history of the kitchen cabinet in Britain. 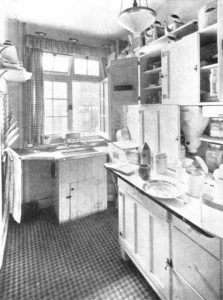 The desire for a servantless, labour-saving, efficient home led to new designs for furniture such as the kitchen cabinet or ‘commodious cupboard’ in the 1920s. More commonly known in Britain as kitchen cabinets, they were also produced in compact form for smaller suburban houses in a range of prices by companies such as Easiwork (see figure 1), Hygena, Ladymaid, Quicksey, Simplette and Savework. By the mid-1920s most British furniture retailers sold at least one style of kitchen cabinet, which were available in a wide range of sizes, prices and specifications. Some kitchen cabinets were made of oak, others painted deal or even aluminium or steel. They took the form of a single free-standing cupboard with multiple doors and drawers. They were organised into compartments to allow for the storage of food and equipment associated with food preparation and sometimes cleaning equipment. They usually incorporated a flour sifter; flour bin; metal-lined bread drawer; rolling pin; ‘shopping or household wants reminder’; bin for sugar; and storage jars. There was a sliding or fold-down worktop for food preparation and also a meat safe; larger ones even included built-in ironing boards. 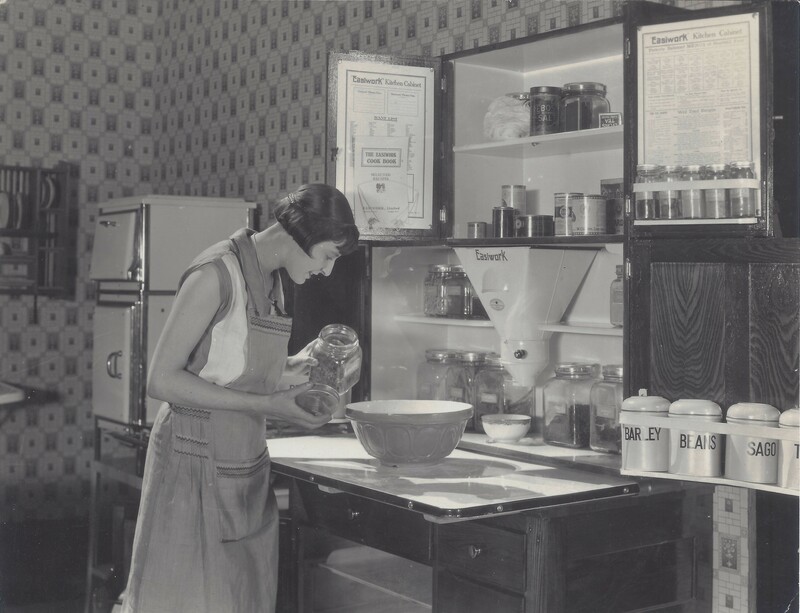 For example, the Easiwork ‘Empire’ had a shelf for proving bread and a notice that suggested menus and information on weights and measures and the care of the cabinet itself. Some retailers even supplied kitchen cabinets fully stocked with food. Many builders installed kitchen cabinets in compact ‘kitchenettes’ as part of the purchase price. The British kitchen cabinet had its origins in the United States. The influential Beecher sisters advised women in The American Woman’s Home, on Principles of Domestic Science (1869) to incorporate a ‘cooking form’ cabinet in their homes to consolidate storage in a compact area and facilitate meal preparation for overworked housewives who did not have servants. Hoosier responded with their kitchen cabinet, which was first manufactured in Indiana from the late 1890s and widely copied. 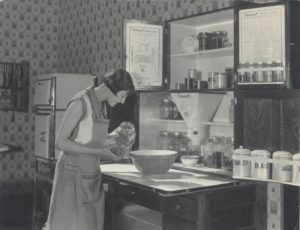 Production peaked in the 1920s when more than one in ten American households owned a Hoosier brand cabinet. Easiwork appears to be the first company to sell kitchen cabinets in Britain. The company was based in London with a factory in Shepherd’s Bush and a showroom in Tottenham Court Road. It was founded by G.E.W. Crowe, a Canadian who originally imported refrigerators and space-saving kitchen cabinets from Canada. Easiwork created the market for kitchen cabinets through their advertising, their endorsement by the Good Housekeeping Institute and participation in exhibitions such as Dorland Hall and the Ideal Home Exhibition. They also introduced porcelain topped kitchen tables, the first stainless steel sink, the first chromium plated steel furniture and the first automatic lighted enamelled gas cooker. 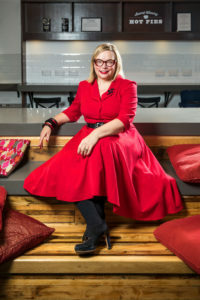 Nancie spoke from personal experience here as she had an Easiwork cabinet in her London home, photographed at the beginning of her book complete with cluttered surfaces (see figure 2). Thus kitchen cabinet may speak the discourse of labour-saving and easier housework but only if certain sets of actions are performed. Nevertheless, it could also signify the professionalisation of the housewife and her modernity and partial recognition of her labour. It was a short step for Easiwork to move from the production of kitchen cabinets with additional side unit extensions to modular kitchen units, which they produced from the early 1930s. These were a part of a range of modular furniture that they commissioned from designers and architects in Britain such as Wells Coates and Erno Goldfinger. These modular kitchens were reminiscent of the 1929 Frankfurt kitchen – arguably the world’s first fitted kitchen that went into production – and developments in Sweden and the United States in the interwar years. However, the era of the commodious cupboard lasted well into the post-war period in Britain. Kitchen cabinets were produced under the Utility furniture scheme in wood and, later, surplus aluminium with an enamelled finish. They continued to be produced until well into the 1950s in Britain. Fitted kitchens took much longer to catch on and were not commonly found in many British homes until the early 1960s. The kitchen cabinet that I demonstrate in A House Through Time is in the Black Country Living Museum. It provoked a huge response on Twitter from people who remembered them and some who still use them. I was delighted to bring this neglected object from Britain’s domestic design history back to life. As we build increasingly small houses, perhaps the kitchen contained in a cabinet has a place in the home of the future. Buy your copy of Ideal Homes, 1918-39 for only £9.99. Simply add OTH785 at the checkout when purchasing your copy on our website. But hurry, the offer expires on 1st February!